Guachinches and what you must know about such cheap eats. What you must know about Guachinches. Guachinches exist mainly on Tenerife Island. There may still be as many as 70 of such make shift eateries in the North. They came about because of an unwritten law that something must be eaten when wine is tasted. Hence vineyard owners organized home made food to offer to potential wine buyers. Over the decades this tradition became competition for real restaurants. Now strict laws must be adhered and a license from the local town hall is required. Most native food of Guachinches. The Gofio depicted below was a mix of wheat and corn. Often, it's wheat only but may be made from other grains, too. 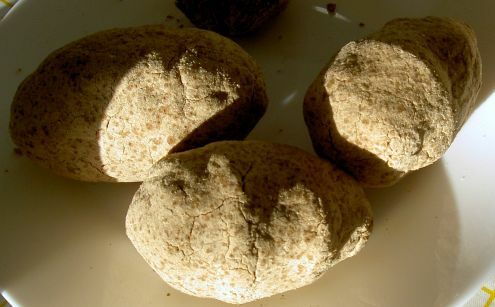 Gofio potato shaped which is served like bread with Tenerife cuisine. Popular Guachinche Gofio dish Escaldon of stewed meat and vegetables. Gofio is an acquired taste but, it certainly is much more healthy than the fast food that is consumed nowadays. No preservatives, taste enhancers or colorants are used with it. However, much has changed since the laws have been passed. Heard of a Guachinche but can't find it? Many had name changes or were closed, while billboards may still stand by the wayside. They were not prepared to follow the new Guachinche law. Most customers want more than three dishes. They also ask for cool drinks. Others prefer a white wine to the red one or vice versa. But only the house wine is legal. 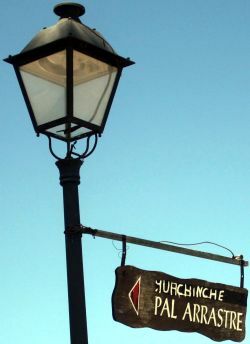 Guachinche Pal Arrastre a renown place to eat out in San Antonio La Matanza de Acentejo doesn't exist any more. Name changes to Bodega, Bodegon, Tasca, Huerta, bar or even Restaurante followed suite. 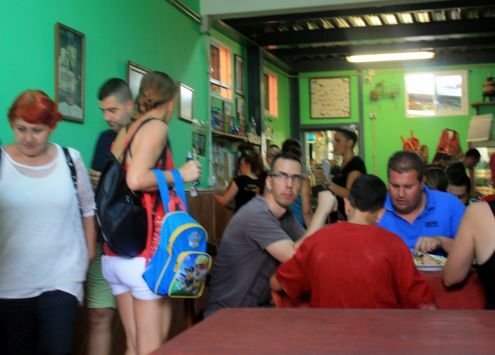 Few were prepared to upgrade to Restaurante, as that means higher prices to the locals in general. The latter also implies a restaurant tax contrary to Guachinches which are treated by the taxman like Minoristas. Others would not even run a business any more during most of the year. They preferred to only open for special holidays, such as the big January Romeria of San Antonio Abad. This is the saint in La Matanza de Acentejo for farm animals, poultry including pets. Long cues outside a cheap eat a former Guachinche. Take the example of the former Guachinche La Huerta de Ana and Eva in La Matanza. It opens on a Sunday at 1 p.m. and is packed with hundreds of people by 1.15. 99% of them are local people. The name change in this case means nothing to local people, as low prices and big servings are more important. But is all food value for money? Guachinches best for roast or grilled chicken. The chicken in all Guachinches and so called cheap eats where I have eaten was excellent as well as good value for money. Friends and I had it at three places in La Corujera in a terribly steep road in Santa Ursula and in six more spots in Puerto de la Cruz ( one in Carretera de la Arena near Casa Verde) as well as in La Matanza. Conejo al Salmonejo which is marinated Rabbit is generally very good in the make-ship rural eats of vineyards, when it's available. 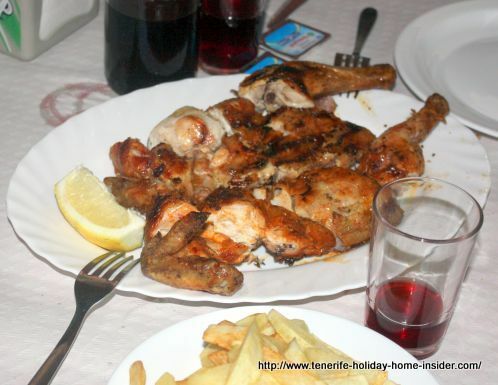 The misconception of cheap Tenerife cuisine in Guachinches. Otherwise, cheap will be when proper Papas bonitas are served at a low price. 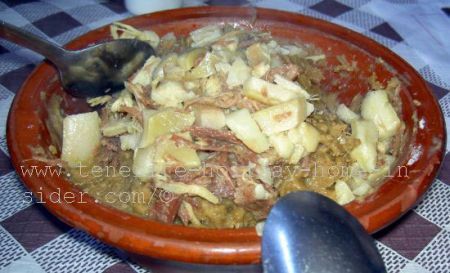 How about Ropa Vieja a Protein rich typical Tenerife dish? Ropa vieja a dish with Garbanzas chick peas. The taste is usually quite pleasant but I wouldn't call its price low when a half portion costs € 4,00 and a double one € 8,00. 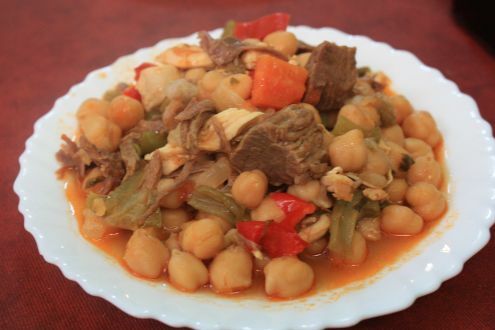 You are served Chick Peas with snippets of Green and Red Peppers and Cordero which is Lamb. The latter is rather there for decoration while the meat stock delivers the taste. The price is too expensive, above all for the time it takes to reach your table... Also, the plate depicted is only of the size of a cake plate. 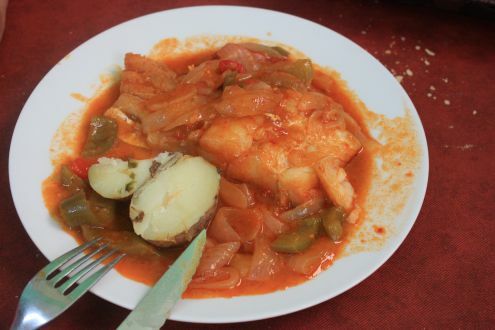 Bacalao con Cebola, as served at La Huerta de Ana y Eva and many other Tascas. Bacalao con Cebolla which is Cod with onion. This definitely requires a very required taste, unless you like extremely salty Cod fish with a strong ocean flavor. This seafood swims in an onion sauce that has been artificially colored orange. We are not in India. Hence, don't expect Turmeric as a natural coloring agent. No red Chilly or sweet Paprika was used either. € 4,50 or € 9,00 for a large portion doesn't buy me. Not even a give away could tempt me. Half a liter of red wine for € 3,00 that tastes like vinegar but which comes from the family vineyard, hence a house wine, can't win me over at la Huerta, either. However, generally, the wines in Guachinches are good house wines of varying quality. Bodega los Guines a Realejos wine producer that seems to have more than one sort where one is very good. What about Carne de Fiesta? I guess it's great when you grew up with pork that's seasoned with pepper and salt only. It tastes far too tasteless that way for my liking. May be some vineyard eating establishments serve good sardines, at some time of the year. We had delicious ones in Vilaflor but it was not in a Guachinche. La Huerta de Ana y Eva entrance room at La Matanza Tenerife is a huge former Guachinche where nothing much has changed in C/Obispo Pérez. Give a second chance to La Huerta de Ana y Eva? This former Guachinche a popular with locals is said to have an excellent mixed salad. Go back there to try it? No, thank you. I am not waiting more than an hour again in the hot road for being called up in a cue. Also, I am not willing to be seated in a corner which has a strange smell and I would hate to have to wait another 20 minutes for my food to arrive. I could ask for a reservation the day before. Sorry, I have to decline. I rather eat less and enjoy. Waiting at la Huerta means that the kitchen staff simply isn't organized to cater for big crowds. Don't be fooled that you will receive the most delicious slow food which takes extra time to cook. By the way, I had ordered Pimientos verdes (green peppers). They arrived loaded with sea salt. I sent them straight back. Other food was sold out already by 2 p.m.
Restaurante Basilio of la Matanza which only has two big dining rooms. The former Guachinche Basilio now the upgraded restaurant Restaurante Casa Basilio, a few meters below La Huerta de Ana y Eva is absolutely recommendable. And that includes real value for money. From Guachinches back to Tenerife restaurants.